Moreover, we find cases when true Torah sages made halachic [Torah-based] rulings, and as a result certain changes took place in worldly matters. There is a well-known story told of the Ragachover Gaon, who was called the “Prince of Torah” by the Rebbe Rashab [the fifth Lubavitcher Rebbe, Rabbi Shalom DovBer Schneerson] and the previous Rebbe [Rabbi Yosef Yitzchak Schneerson]. The Ragachover once received a letter from the government tax department which described two types of taxes which he was being charged. He studied the bill and the explanations and then said that one form of tax was legitimate on the basis of the Torah, and therefore should be paid in accordance with the dictum, “The law of the government is law” (Tractate Gittin 10b). However, he pointed out that the second tax was not acceptable by Torah standards and should not be paid (see Maimonides, Laws of Robbery, 5:14). Several days passed and a second notice arrived. This time the tax department apologized for making a mistake in the previous tax bill and admitted that he was not liable to pay the second tax! Quite an extraordinary occurrence! In “that” country [Russia], which opposed all aspects of Judaism, Torah and its commandments [mitzvos], and in the city of Petersburg, where many important government ministries were situated, and where the protocol of government bureaucracy was carefully adhered to, the Ragachover’s halachic ruling, based on the Torah’s truth, caused the government to withdraw its demand for taxes – truly amazing! The incident was all the more astonishing when we remember that in “that” country, once someone was assessed a tax it was virtually impossible to rescind the assessment, yet here they recalled the tax bill and apologized! The power of a Torah ruling can change the way the world functions, against its own nature. Unlike this story there are many rulings of Torah which already exist and need not be judged anew. One example would be the ruling of Maimonides: … to encourage the Gentiles of the world to act in accordance with the Seven Noachide Commandments. [This concerns] the welfare of all peoples, for the world was “formed to be inhabited,” which will only be when society follows the Divine plan. In this country there is an additional incentive, since the President has issued a proclamation urging and encouraging the observance of the Seven Noachide Laws. He has indicated that only in this way can the world remain inhabited and civilized. … The President’s proclamation emphasizes the revelation of G-dliness through the essence of the corporeal world. It also lends support to disseminating the Seven Noachide Laws among all humanity. It is therefore appropriate to express our appreciation to the Government of the United States and to its head, the President, for this proclamation regarding the Seven Noachide Laws. At the same time we must express our gratitude to the Holy One Blessed be He that our government represents a benevolent republic, which extends assistance and aid … [An important] act in that respect was to help gain the release of the previous Rebbe from “that” country [in 1927]. This set the stage for the continuous expansion of Chabad Chassidus through the previous Rebbe to the rest of the world, until Moshiach’s days. The duty is enjoined upon them to set up judges in each district to deal with these six commandments and to caution (educate) the people. 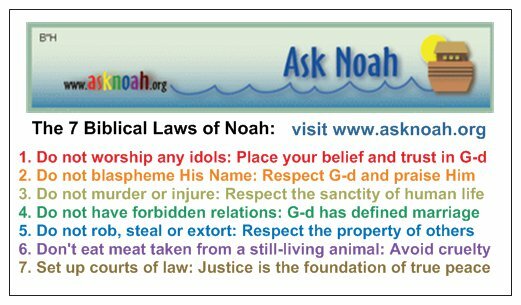 Clearly they must teach the people to know and to live by the Laws of Noach. The foundation and basis of the Seven Noachide Laws is love and brotherhood. Even the word Noach indicates: pleasantness and friendliness. And when Gentiles observe the Seven Noachide Laws they are called “pious (righteous) Gentiles,” which indicates kindness and love. This means that even when the child needs chastisement, do it only “with the left hand,” meaning with restraint, while at the same time reach out to assist him “with the right hand.” For a teacher to be successful he/she must speak to his/her students with words that emerge from the heart, for only then will they penetrate the heart and accomplish their goal. 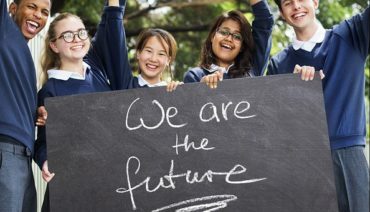 Most importantly, teachers must always remember that the first principle of education is that the teacher must be a living example, many times over. Yet the true quality of “action” emerges specifically in such a scenario when one must mobilize and concentrate his self-control to the point of self-imposed, forced action, to reach out to teach the descendants of Noach the Seven Noachide laws, … to impress upon the Gentile his/her responsibility to observe the Seven Noachide laws. And if he/she is already aware of the Seven Noachide Laws, then the effort should be made to encourage increased observance of those laws. “Then I will turn to the peoples a pure language, that they may all call upon the Name of the L-rd to serve Him with one consent” (Tzephaniah 3:9). We therefore must see this as a commandment whose time has come, now! Regarding the observance of mitzvos (the commandments for Jews) in the diaspora, we have learned that we do them now so as to be prepared for the ultimate observance which will be when Moshiach comes (cf. Maimonides, Leviticus, 18:25). The same idea also applies in the case of the Gentile world. They, too, must prepare themselves for that future time, and the closer we get to the redemption, the more vital it becomes that we influence the nations to observe the Seven Noachide laws. As if to stress the importance of motivating all people to fulfill the Seven Noachide laws, the Holy One, Blessed be He, has put in the heart of the President of this country (“The king’s heart is in the hand of the L-rd,” cf. Proverbs 21:1) the desire to proclaim and publicize to all the citizens of this country – with the approval of the representatives of the people of the land – the need and importance of keeping the Seven Noachide laws for the good of the existence of this country and its people. The President himself was not satisfied with his earlier proclamations, made in previous years, and once again this year issued a proclamation which calls for the observance of the Seven Noachide Laws among all peoples of the world. We must express our gratitude to the President for this magnanimous action on behalf of the Gentile world. … Our hope is great that these efforts will continue among the nations of the world and will be especially successful, in that the President has shown a living example in his personal conduct to spread the Seven Noachide Laws, with no ulterior motive other than it being the word of the Creator.